President S. Georgia Nugent announced on August 13 that she decided to step down at the conclusion of the 2012-13 academic year. In accepting her decision, the Kenyon College Board of Trustees expressed its gratitude for her decade of distinguished service. 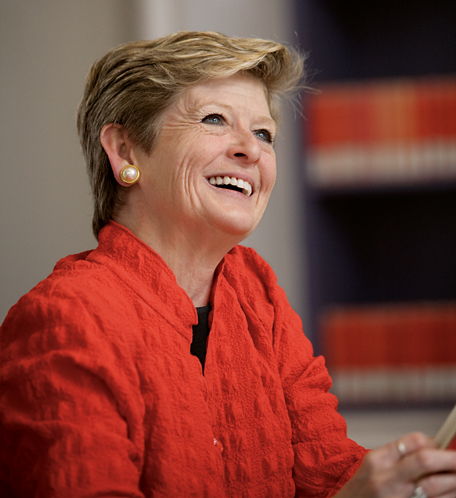 Soon after her arrival at Kenyon from Princeton University in 2003, Nugent began to sound themes that were central to her presidency: access to education and “polishing the gem” of Kenyon’s national reputation. On Nugent’s watch, Kenyon became an even more selective college, one of the most selective in the Midwest, attracting a more diverse and international student body, fueled in part by her commitment to ensuring access to education for talented students of all economic backgrounds. With her advocacy, more than $60 million in endowed financial aid—a Kenyon record—was raised during the recently completed “We Are Kenyon” capital campaign. Nugent’s own contribution to the campaign established a scholarship fund for first-generation students. In addition to her efforts to increase access, Nugent has been increasingly concerned with advocacy for the value of liberal arts education, and she plans to assume a broader role in the national discussion about the future of higher education. In recent years, she has chaired the boards of the Council of Independent Colleges and Higher Education Resource Services, as well as serving on the boards of the National Association of Independent Colleges and Universities and the American Council on Education. She is also a member of the Council of Presidents of the Association of Governing Boards. Nugent made the announcement just before the academic year began in order to facilitate a smooth transition process. “This will be a significant year at the College, and it seemed the right moment, before the year began, to inform our key academic and administrative leaders of this important decision as we moved forward with future projects,” she said. Nugent’s legacy includes a strong interest in improving the quality of life for Kenyon employees by initiating the Presidential Advisory and Communications Team and the Kenyon Childcare Program. She has also overseen an unprecedented program of new building construction and renovation.